Other people can be given Guided Tour at the RACAB. This institution, with more than 250 years, is located in an eighteenth century building, in the city centre. In its conference room, Albert Einstein exposed the relativity basis. In the adjacent room there rest a Billeter astronomical clock dated in 1869 which indicates the time and also the exact position of some planets, the Earth, the Moon and the Sun until 2029. This is a building where the passion for architecture and the devotion to science are amazingly represented. To attend the "Guided Tours to the RACAB" will have to make the reservation and the payment. 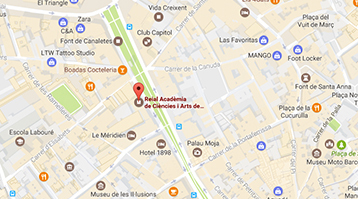 The visit to the Royal Academy of Science and Arts of Barcelona [RACAB] will not be cancel due to weather. They can give other people Guided visits to the Royal Academy of Science and Arts of Barcelona, gifts can choose the day they wish to enjoy the experience within the dates of the activity.